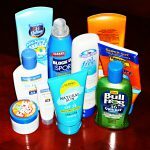 Finding good sunscreen products will lead to the best ways to prevent skin cancer. So you want to protect your skin? Then, the best ways prevent skin cancer is with the use of top rated sunscreen products whenever you are outside. Quality sunscreens help shield you from the sun’s dangerous ultraviolet (UV) rays in two ways. First, some work by scattering the sun light, i.e. reflecting it away from your body. Others absorb the UV rays before they reach your skin. Ultraviolet radiation are invisible rays that are part of the energy that comes from the sun. In addition, these rays can burn the skin and cause skin cancer. Sun rays are made up of three types: ultraviolet A, ultraviolet B, and ultraviolet C. Although ultraviolet C is the most dangerous type of ultraviolet light in terms of its potential to harm life on earth, it cannot penetrate earth’s protective ozone layer. Therefore, it currently poses no threat to human, animal or plant life on earth. Ultraviolet A and ultraviolet B rays, on the other hand, do penetrate the ozone layer and reach the surface of the earth. Because ultraviolet A is weaker than ultraviolet B, scientists long blamed ultraviolet B as the sole culprit in causing skin cancer. 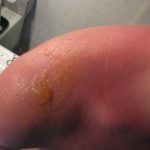 This was due to people with sensitive skin with a history of sunburn and repeated overexposure to ultraviolet radiation. Recent research, however, has also implicated ultraviolet A as a possible cause of skin cancer. Ultraviolet B rays are more likely than ultraviolet A rays to cause sunburn. However, ultraviolet A passes further into the skin. Scientists have long thought that ultraviolet B can cause melanoma and other types of skin cancer. They also now think that ultraviolet A may add to skin damage that can lead to cancer. Therefore, dermatologists recommend that people use sunscreens that block both kinds of radiation. A few years ago, choosing a good sunscreen meant you just looked for a high sun protection factor (SPF). In essence, the SPF factor only rates how well the sunscreen protects against one type of skin cancer causing UV ray – ultraviolet B (UVB). Research soon showed that ultraviolet A rays (UVA) also increases skin cancer risk. While UVA rays don’t cause sunburn, they penetrate deeply into the skin and can cause wrinkles. The Environmental Protection Agency has estimated that up to 90% of skin changes associated with aging are really caused by one’s lifetime’s exposure to UVA rays. Personal tip: If you have hypersensitive skin, a rule of thumb for protecting it: the fewer chemicals, the better. Finding SPF options without skin irritants like parabens, fragrances, and dyes helps prevent painful flare ups and poison ivy level itching. Natural sunblocks are your best bet. As part of the third step of the Murad three-step skin care regimen, Step Three: Hydrate/Protect, Murad sun protection products include broad spectrum UVA and UVB coverage. These Murad products have both SPF and PA protection ratings. Skin cancer is an abnormal growth of skin cells. It most often develops on areas of the skin exposed to the sun’s rays. More importantly, skin cancer affects people of all colors and races. However, those with light skin, who sunburn easily, have a higher risk. These dry, scaly patches or spots are pre-cancerous growths. Frequently develop in people who have fair skin, yet they can occur in people with darker skin. Develop after years of frequent sun exposure or indoor tanning. They are common on the head, neck, and arms, yet can form anywhere on the body, including the chest, abdomen, and legs. Early diagnosis and treatment for BCC is important. It can invade the surrounding tissue and grow into the nerves and bones, causing damage and disfigurement. It often looks like a red firm bump, scaly patch, or a sore that heals and then re-opens. SCC tends to form on skin that gets frequent sun exposure, such as the rim of the ear, face, neck, arms, chest, and back. It can grow deep in the skin and cause damage and disfigurement. Early diagnosis and treatment can prevent this and stop SCC from spreading to other areas of the body. It frequently develops in a mole or suddenly appears as a new dark spot on the skin. Knowing the ABCDE warning signs of melanoma can help you find an early melanoma. See the American Academy of Dermatology (AAD’s) body mole map shown below to note the results of your self-examination. Consult your dermatologist immediately if any of your moles or pigmented spots appear on the illustration. Is varied from one area to another; has shades of tan, brown or black, or is sometimes white, red or blue. When caught early, skin cancer is highly treatable. 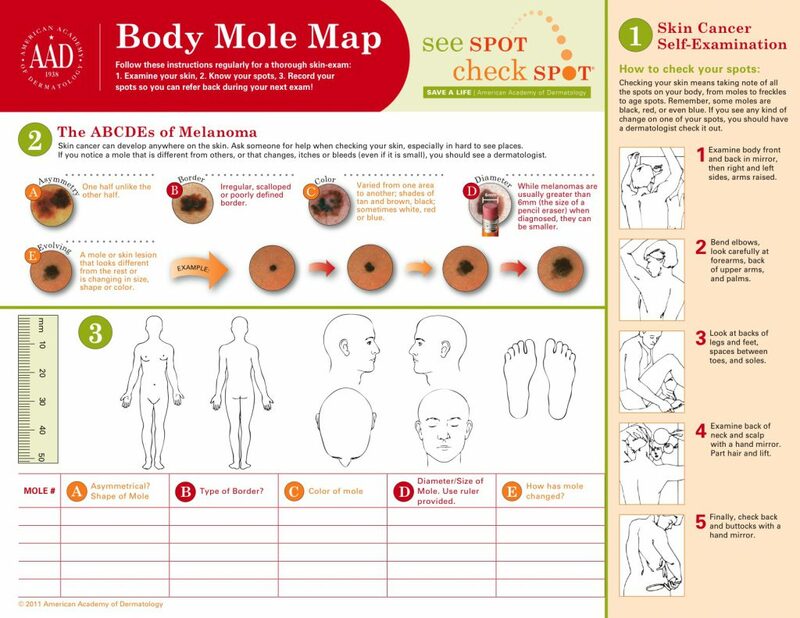 See the AAD’s body mole map below for information on how to check your skin for the signs of skin cancer. Also, keep track of the spots on your skin and make note of any changes from year-to-year. Personal Tip: If you notice a mole that is different from others, or that changes, itches or bleeds, you should make an appointment to see a dermatologist. 1.) Avoid the sun during the middle of the day. 2.) Use Sunscreen year round. 5.) Be aware of sun-sensitizing medications. 6.) Check your skin regularly and report changes to your doctor. If you notice a questionable spot on your body, visit your dermatologist for testing. If it is skin cancer, treatment may include freezing the skin with liquid nitrogen, removing the skin growth layer by layer, or surgery to cut out the cancerous tissue. Additional treatment for melanoma may include radiation therapy and chemotherapy. I spend a great deal of time outside. I wear my bucket hat and sunglasses when I am out. I have not had a sunburn in years. I try to limit the amount of sun I get. Great information to know about skin cancer as I am getting a lot older. Having information to prevent the long term effects of skin cancer is very helpful. John, great to hear that you haven’t had a sunburn in years. When outdoors do use a sunscreen of at least 30 SPF for protection. Skin cancer can occur from past exposures to the sun. We are never in the clear when it comes to when the exposure takes place. Skin cancer can and often times takes years to pop up. Check your skin frequently. This is great information for me as I live in the great sunny state of Florida and I just spent the past two days at the beach. I do put on sun screen, and I use a high spf on my face all the time. The rest of my body….well that can get neglected. But after reading this, I know that I need to be more diligent in my skin care. I do have an appt. with a dermatologist just for my normal check up on my skin. I do try to stay proactive! It’s good to know that you are proactive with your skin care. You need to use the sunscreen all over your exposed body when in the sun. My wife had some skin cancer (Basil Cell Carcinoma) removed from her shoulder and she is from Colombia and grew up about 300 miles from the equator. She has a great natural tan. Also, I had two tumors (skin cancer) removed from both my arms that turned out to be melanoma which can kill you. The two of us have had all three forms of skin cancer not something I recommend for anyone. Melanoma can spread to other parts of the body. President Carter’s brain cancer started out as skin cancer. For him, he eventually was cancer free from some serious treatments he got. Great article you have here, very informative. I didn’t have a clue that there were 3 types or UV rays – and that actually only 2 reach the earth! What worries me is the fact that now we have holes in our Ozone layer and that means that UVC could be getting through – right? That is why Australia and New Zealand have higher rates of skin cancer. What do you think? Orion, I think you are 100% correct in your comments. I have to say that your article was very helpful for me. I live in Greece, in Rhodes and the sun is very strong. The Uv radiation is very strong also and I am blond with fair skin so… I think I have to take care a lot. Choosing the right skin protection is very important because no one wants to have skin cancer:( I can see you are a pro on this subject. I will take your advice to wear sun cream all year. I really found informative generally your site and I will surely be back for more information. Thanks a lot for sharing. Thank you Cristina for your comments. Do use a sunscreen of at least 30 SPF when outdoors in the hot sun. I always wondered how ancient people tackle these UV rays without sunscreens. Though sunscreens have their own benefits, I prefer natural ways. Could you suggest some? There are so many misinformation regarding sunscreen all over the internet. Your article is far different all those. Thanks for this interesting and informative article. Thanks for the comments. The problem with all natural sunscreens is the SPF rating, if any. Here are a few natural sunscreens. Notice some have low SPF values. The individual ingredients are considered low SPF. Wow, my immediate impression is that your site is the authority on Skin Care. I know melanoma is on the rise in Ireland and people really need not to be using those sun beds and really protecting their skin. I believe you are providing a very valuable service and I do hope many read your advice here, it could save their lives. Thank You Phillip for your comments. My wife and I have experienced all three skin cancers which is the reason we got involved with skin care. We have been lucky in that we are cured. We are just trying to educate the public concerning this god awful disease.